"My brother has his sword, and I have my mind…"
The game begins with all locations on the board available. Winterfell may be home to the Starks and Pyke to the Greyjoys, but that doesn’t mean someone else can’t conquer them. When your turn comes, select a location and choose a small, medium, or large marker, indicating how many questions you want to answer that turn and how much of the location you might control by answering them. A small knight marker means that you intend to answer one question—usually a less difficult one. A horse marker compels you to answer two harder questions, and a large crown marker makes you answer all three questions on a card. If you answer all of the required questions correctly, you take over part of your desired location. If you answer any incorrectly, you made no headway and your turn ends. 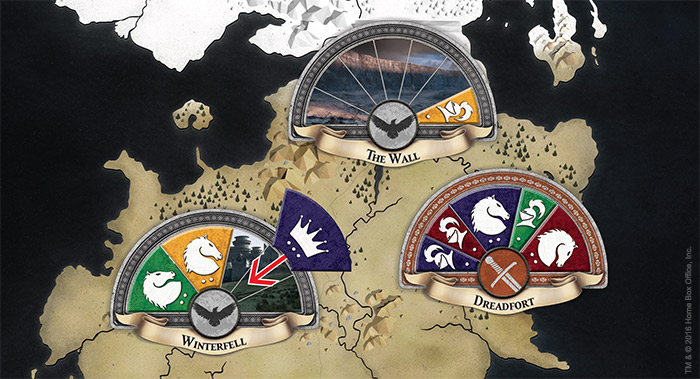 In the diagram above, the purple and the red players have fought a bitter struggle over the Dreadfort, only to have the green player intervene with the result that no one controls the seat of House Bolton. Temporarly thwarted, purple now sees an opportunity at Winterfell and places a crown marker there, hoping to capture that castle in a single turn. The green player draws a card and reads both the top question and its possible answers. When the purple player answers correctly with, “guards the realms of men,” he proceeds to the second question, then the third. However, at that point the purple player fails to remember which career was predicted for Bran. She is forced to withdraw her crown marker and give another player the chance to take over Winterfell. Some rounds, including the game’s final round, are picture rounds. 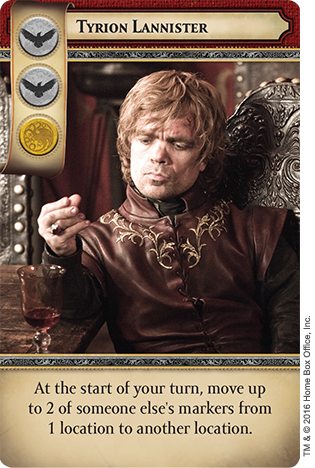 Picture cards are drawn from a different deck and all questions on a card pertain to the image on its front, perhaps a character, a house sigil, or a scene from the show. Both picture cards and regular cards indicate what season they draw upon, so you can organize your cards season by season. This lets you avoid spoilers for members of your group who haven’t seen all of the first four seasons. You could binge-watch a single season, then play the trivia game using questions about the episodes you just saw, play the game season by season over the course of an evening, or shuffle together all four seasons for the ultimate Game of Thrones trivia challenge. 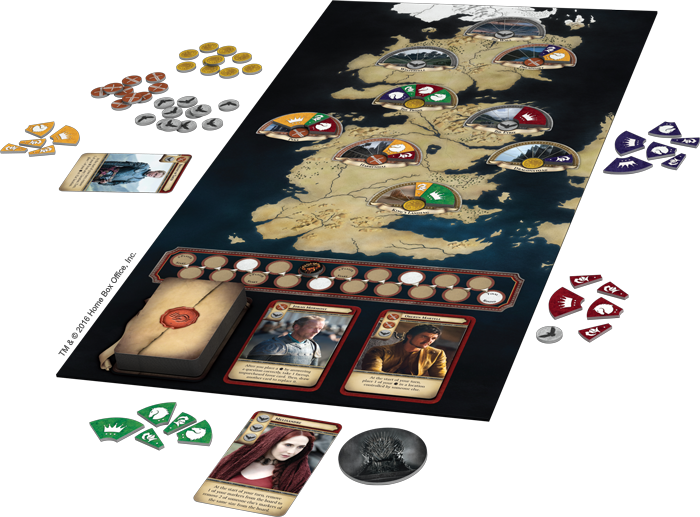 Game of Thrones: The Trivia Game features both a basic and advanced game. In the latter, answering questions offers more than territorial control. Every question you answer correctly gives you resource token: a piece of gold, a raven, or a sword. You can spend these resources to win the favor of iconic Game of Thrones characters who offer unique and impressive abilities. Two ravens and a sword will win over Jon Snow, who allows you to transform an incorrect answer into a horse marker. 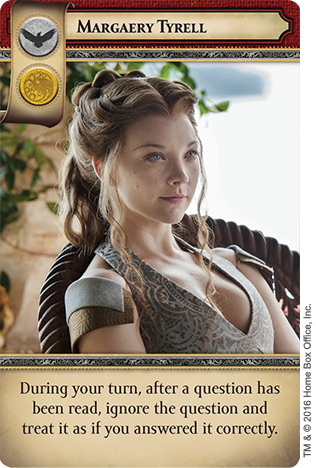 With a raven and a piece of gold you can earn the support of Margaery Tyrell, who lets you ignore a question and proceed as if you answered it correctly. However, loyalties are always shifting: each favor card must be discarded once used. You can also make mutually beneficial alliances with other players. If, after hearing a question, you feel that you cannot answer it, you can ask another player for help. That player answers the question and gains the resource from it, but you earn all the other benefits of a correct answer. But be careful. While such alliances are temporary, they may have significant consequences. As Barristan Selmy said, “Men who fight for gold have neither honor nor loyalty—they cannot be trusted.” As you make alliances you may want to remember that. Like any weapon, knowledge is only deadly if you know how to wield it, and to rule the Seven Kingdoms, you’ll need to wield your knowledge of them even better than Jon Snow wields his sword or Tywin Lannister his wealth. You must unite your knowledge with cunning, foresight, and ruthlessness if you want to win the Iron Throne. 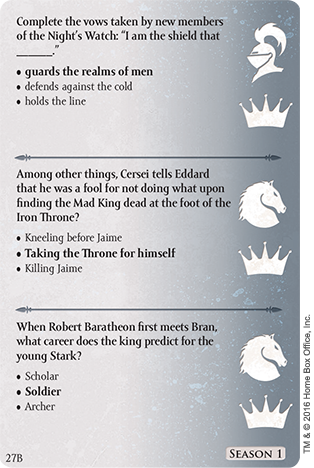 Watch this space for the rules and other support material related to Game of Thrones™: The Trivia Game! Game of Thrones TM & © 2015 Home Box Office, Inc.